German Beach is situated in strategic location close to the Ngurah Rai International Airport, hotels and resort, restaurant and of course the Kuta Beach. The beach is still in line to the Kuta Beach, Legian and Seminyak, located in the very south adjacent to airport runway. 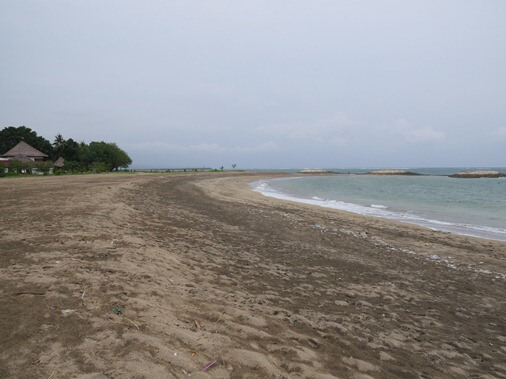 Visitors can access the beach from Jalan Wana Segara, still included in the administration area of Kuta (Kelurahan Kuta), District of Kuta, Badung Regency, Bali. German Beach was originally the site of the Port of Kuta or Coetaen or Kotta, which is one of the important ports at the time and used by merchants to trade. The existence of the Kuta Port can be traced from the history of the Danish merchant, Mads Johansen Lange (1807-1856). He set up a factory or fortified trading post at the southern peninsula near the fishing village of Kuta. 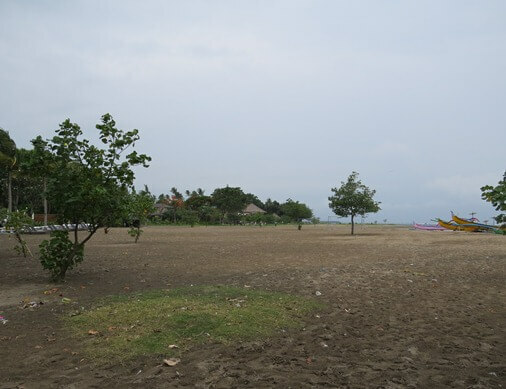 This place is a narrow peninsula and also it allows to loading the goods from the east and the west side, located in the southern part of Bali. The important trade commodities at that time were the rice. Lange sees the supply shortages of rice in Asia. While Bali at that time, the majority of the population has the expertise to grow rice, and the climate in Bali allows the harvest conducted three times a year. In addition to rice commodities, Lange also gets benefit from the monopoly sales of Kepeng China. Kuta Port is also used for transactions of other commodities such as coffee, tobacco, coconut oil, leather, cotton, cattle, ponies, pig and poultry. During the Dutch intervention in Bali (1906), followed by 1914 (Bali opened for tourism), many people with foreign citizenship coming to Bali. In the 1930s, anthropologists Margaret Mead and Gregory Bateson, artists Miguel Covarrubias and Walter Spies, and musicologist Colin McPhee all spent time here. Their accounts of the island and its peoples created a western image of Bali as "an enchanted land of aesthetes at peace with themselves and nature." Began Western tourists to visit the island. Ngurah Rai International Airport which was originally named the Tuban Airfield or Pelabuhan Udara Tuban, established in 1931 at the narrowest point on the southern coast of Bali. At the same era, around the areas of Kuta Port, many hotel and guest house were built to serve the room needs (a place to stay) for foreign citizenship such as the European and USA. Along the coastal areas around Kuta Port has been developed into seaside resort and also at that time, many Dutch photographers capturing the image of the outrigger boat and traditional fisherman activities on the beach. In the World War II (1940) when Germany invaded Holland, all German nationals in Indonesia or Dutch East Indies (including Bali) were arrested as enemy aliens and subsequently transferred to be interned in Sumatra by the Dutch-Indies government. Walter Spies (German painter) was also arrested. Furthermore, the Japanese army attack on Pearl Harbor in 1941, the German prisoners were transferred to the west of Sumatra to be moved to British India (Ceylon or Sri Lanka). There were three ships that brought Germans to India, the third ship is the SS Van Imhoff sailed on 18 January 1942. The next day on 19 January 1942, SS Van Imhoff was bombed by Japanese aircraft. Dutch crew managed to escape, few German prisoners survived up to Nias (Pulau Nias), and most of the rest, including the painter (Walter Spies) stuck on the ship SS Van Imhoff which is sinking gradually. The origin of the name itself ("German Beach") is still unclear. 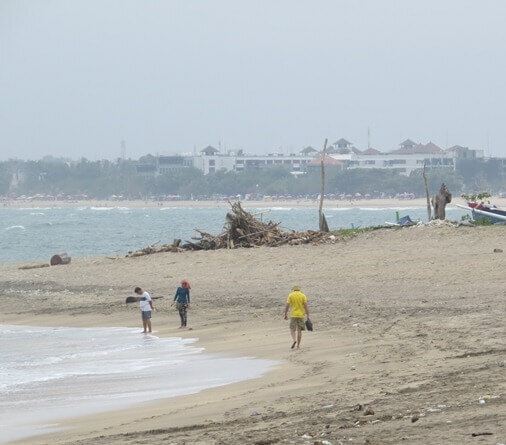 However, several sources mention the name of the beach is closely linked to the history of the port of Kuta (Coutaen or Kotta), the development of the area around the port Kuta (hotel and beach resort), the existence of European citizens, and deported of German citizen by the Dutch during World War II. 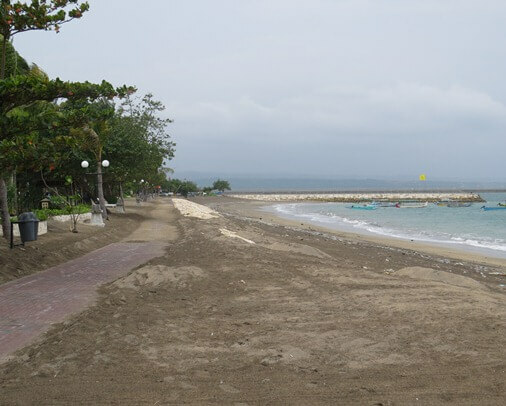 Local residents also have long been familiar with the name of this beach as German Beach. This beach has character of flat type beach coupled with white sand layer which is thick enough, ready to spoil your feet while walking on the water's edge along with the waves. This place has beautiful scenery in the north and south, the blue sea, and colorful row of traditional fishing boat. Many fishermen moor their boats around the beach. 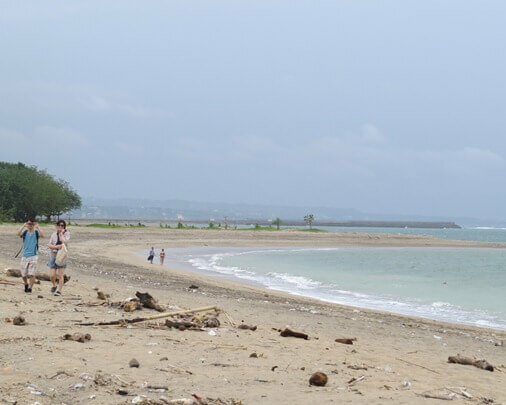 In addition to relying on the results of the marine fish, fishermen also earn income from the services to bring the tourists to drive around the beach on their boat or the surfers to the "surf spot" that located in the middle of the sea. Visitors can linger at the beach while relaxing and sunbathing under the warm tropical sun. Also watch the unique view of aircraft landing and take-off at Neural Ray International Airport. For photography lovers, this beautiful beach can be an option to realize your creation with the camera and your photography skills. German beach is also blessed with a romantic view of the sunset as well as the Kuta beach, Legian, Seminyak and Jimbaran. With stunning sunset views on the afternoon, romantic and quiet, of course it could be an option to spend your time while in Bali.